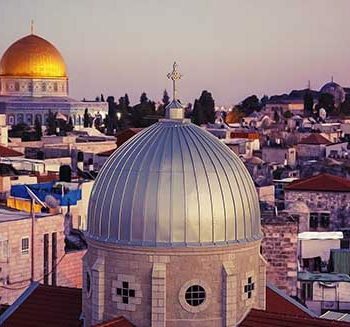 The 15 day Jewish Israel Tour takes you on a journey to the land of where it all began. 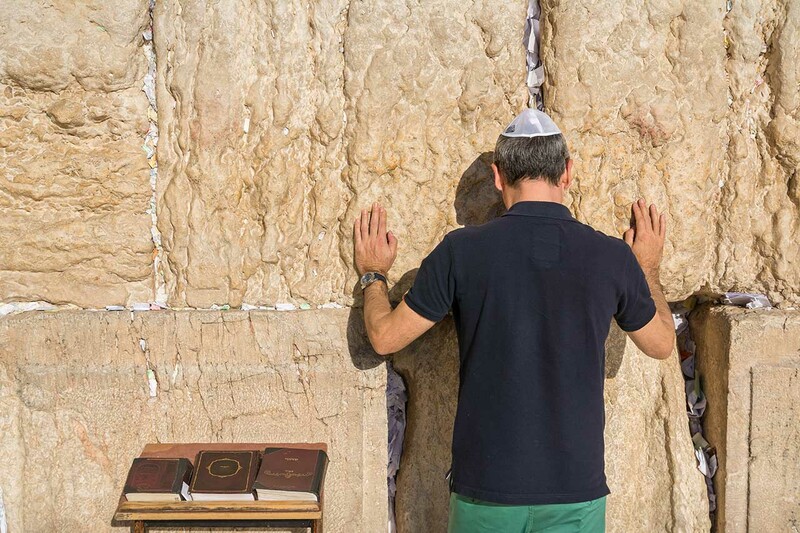 Join us on a magnificent journey through Israel on our 15 day Jewish Israel tour. Welcome to Israel! Upon arrival to Ben Gurion airport, you will be met and assisted before passport control. Following passport control, you will be transferred to your hotel in beautiful Tel Aviv, situated on the Mediterranean Coast. Enjoy the remainder of the day at leisure before we embark on our 15 Day Jewish Israel Tour. Following our first breakfast in Israel, we will meet our guide and start our first day of touring. First we will visit Independence Hall, best known as the site where David Ben Gurion declared the creation of the State of Israel. Continue to drive to Latrun and visit the Armored Corp Museum. One of the most diverse tank museum in the world. Proceed to “Mini Israel Park” to see the miniature models of the most important sites and buildings in the country. Moving on to the Ayalon Institute. Once an ammunition factory for the Hagana. This was an underground movement before May 1948. To conclude the day of touring, we will return back to our hotel for the remainder of the day at leisure. Following breakfast, we will start our day with a visit the Beit Hatfusot (Diaspora museum), the Museum of the Jewish People. Proceed to tour the main streets of Tel Aviv, the business centers and the entertainment district of Israel. Continue with a stop at Rabin’s Square, the place where Prime Minister, Itzhak Rabin was assassinated. 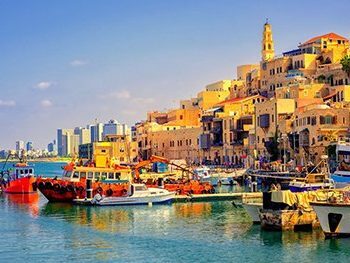 Moving on to visit Old Jaffa, an 8000-year-old port city; visit the ancient ruins and walk along the restored artists’ quarter. In addition, visit Neve Tzedek, the first neighborhood of Tel Aviv that was built in 1909. Furthermore, we will visit Nahalat Benyamin. The pedestrian street market with musicians, handmade jewelry and artifacts on display. To conclude, we will visit Sheinkin street. A lively and colorful street especially known with the unique shops, café life and youthful ambiance. Return back to our hotel for the remainder of the day at leisure. Following Shabbat breakfast, we will enjoy a day at leisure. BREAKFAST. Following breakfast, we will check-out from our hotel. Travel north along the coastal Plain of the Mediterranean to visit the ancient city of Caesarea. Proceed to view the excavated Roman Theatre once used for many performances throughout the centuries. Continue through the excavated fortress and view the aqueduct, once used for conveying water to the city. Moving on, the tour will continue north towards Haifa and ascend Mt. Carmel. Stop for a panoramic view of the Bahai Gardens and Haifa Bay. Proceed to “AF AL PI CHEN” the naval museum of the illegal immigration to Israel at the time of the British mandate. Following Haifa we drive north along the coast and stop at Akko (Acre) to see the ancient fortress. Known for its underground passages and secret rooms. Visit the prison where members of the Hagana and Irgun were held captive during Israel’s fight for Independence. Furthermore, we will continue to the northernmost point of Israel at Rosh Hanikra. This is where the border meets Lebanon. Descend by cable car to see the limestone Grottos created by the Mediterranean Sea. To conclude, we will proceed to our Kibbutz along the shores of the Galilee where we will spend our night including dinner. BREAKFAST. Following breakfast, we will start our day with a drive south to the Mystical City of Safed. It is considered to be one of the Four Holy Cities according to tradition and its Kabalistic studies (the birthplace of Kabbalah). Proceed to the Golan Heights for a Jeep adventure. The tour explores the Golan Heights and its terrain by jeep. Stop at an observation point overlooking the destroyed city of Kuneitra (Syrian territory). Furthermore, stop at Tel Facher, a former Syrian army camp. Continue north to Banias Springs, considered the largest spring feeding from Mt. Hermon and leading into the Jordan River. To conclude, we will visit Tel-Hai. See the “Roaring Lion” monument. Lastly, return to our Kibbutz Hotel for a relaxing dinner in the Upper Galilee. Following breakfast, we will drive to Tiberias to visit Rambam’s grave.Continuing south via the Jordan Valley to the ancient City of Beit Shean, also called “Scythopolis”. Proceed to walk through the largest ongoing archaeological dig in the land of Israel. Proceed to visit Beit Alpha to see the beautiful mosaic floor of a Byzantine synagogue. Moving further south to visit Gan Hashlosha (Sachne). 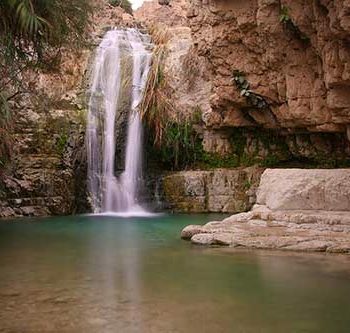 We will have the opportunity to enjoy the water springs, located at the foot of the Gilboa Mountain. Furthermore, we will proceed south through the lush Jordan Valley. Upon arriving in Jerusalem we will stop at Mt. Scopus for a beautiful panoramic view of Jerusalem and the Old City. To conclude, arrive at our hotel for check-in. BREAKFAST. Following breakfast, the tour will start at Mt. Zion to visit the tomb of King David. Proceed to enter the walled city of Jerusalem and proceed to the Jewish Quarter. It was reconstructed after the city was unified at the conclusion of the Six-Day War in 1967. Continue with our walk to the broad stone stairway down to the holy Western Wall – the “Kotel” (Beit Hamikdash). Moreover, descending through the many layers of Jerusalem’s past at the time of the Temple through the Rabbinical Tunnels. An incredible labyrinth of tunnels, arches, and passageways remain untouched for centuries. Continue towards the Southern Wall excavations to see the Davidson Center. It is one of the most significant archeological sites in the country. To conclude, return to the Roman Cardo though the local Arab Bazaar (Suk). Walk out of the Old City through the Jaffa gate to visit David’s Tower Museum. See the ancient remains of the city beginning with the first Temple period. BREAKFAST. Following breakfast, enter the Old City through the Dung Gate and walk towards the Kotel and witness a Bar Miztvah ceremony. Depart the Old City and drive to Mea Shearim. Learn about the unique lifestyle of the Ultra orthodox communities. Proceed to drive to Mount Herzl, Israel’s national cemetery. We will visit the grave-sites of Israel’s greatest leaders and heroes. Moving on, continue to Yad Vashem. Considered to be the first memorial to mankind’s darkest period. We will visit the very moving exhibit at the Children’s Pavilion. Furthermore, continue to Ammunition Hill (Givat-Hatahmoshet). This is a former Jordanian army stronghold conquered by the Israeli army in the Six Day War. We will also drive by the Knesset, to see Israel’s parliament and the Menorah with the biblical emblems. To conclude, proceed to Israel Museum to see the scale model. The museum recreates Jerusalem in 66 CE. In the same complex, visit the Shrine of the Book where the original Dead Sea scrolls are housed. BREAKFAST. Drive through the Judean hills to Qumeran caves, where the Dead Sea scrolls were found; Continue along the shores of the Dead Sea to Massada, the last stronghold of the Jews after the destruction of the Second Temple in 70 A.D; ascend Massada by cable car and tour the mountain fortress built by King Herod; visit the remains of the walls, water cistern and Herod’s Palace; descend by cable car. 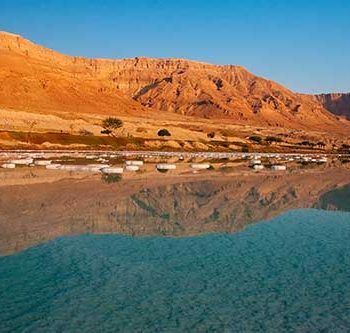 Continue to the Dead Sea, the lowest point on earth; enjoy the opportunity to float in the unsinkable water and cover yourself with the mineral rich mud, believed to have therapeutic effects. Breakfast. Enjoy the day at leisure. Petra Extension: Following breakfast, with assistance of a visa at the Jordanian border, drive straight to Petra, the astonishing rose-red city built by the Nabateans (An early Arab tribe). Petra was renowned for its massive architecture, pools, dams and water channels. Moreover, the city itself is almost 45 square km and is considered to be the second wonder of the world. Following the visit, time for lunch in a nice restaurant. After lunch drive back to border. Furthermore, a short visit to Aqaba with the possibility to stop and take a walk around. To conclude the day, transfer to the border at around 18:00 p.m and crossing back into Eilat, Israel. BREAKFAST. 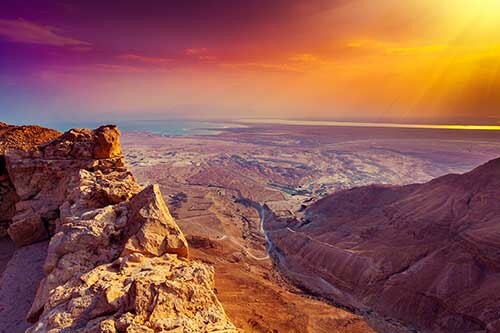 Following breakfast, we will depart Eilat via Mitzpe Ramon and stop to gaze into a geological wonder, the Ramon crater. Proceed to Sde Boker and see Ben Gurion’s hut and grave overlooking the magnificent Zin valley. Stop for a camel ride and a visit to an authentic Bedouin tent. Furthermore, learn about the Bedouin hospitality and enjoy a light lunch. To conclude the days touring, continue to Hatzerim and visit Israel’s Airforce Museum. Arrive in Tel Aviv for our last night in Israel. EARLY BREAKFAST. To conclude, we will transfer to Ben Gurion Airport for departure back home with lifelong memories.